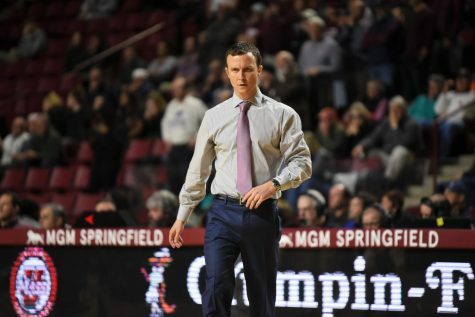 Even though the Massachusetts men’s basketball team drew even with its six games over the break (three wins, three losses), the team can walk back on campus with two convincing Atlantic 10 victories under its belt. The break featured a very up-and-down set of contests for the Minutemen (10-6, 2-1 A-10). 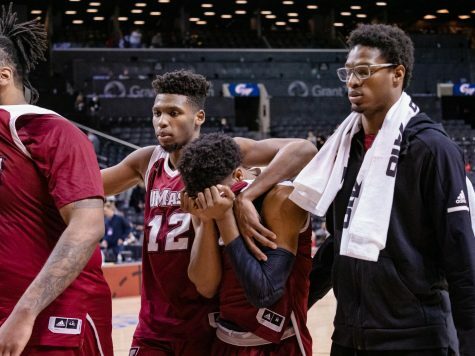 Plagued by shooting woes and failed defensive stops, UMass picked up from the charity stripe and found different and less conventional ways of winning. On Saturday, the Minutemen finished off the break with a defensive effort that held off a late La Salle run, as they defeated the Explorers, 74-71. 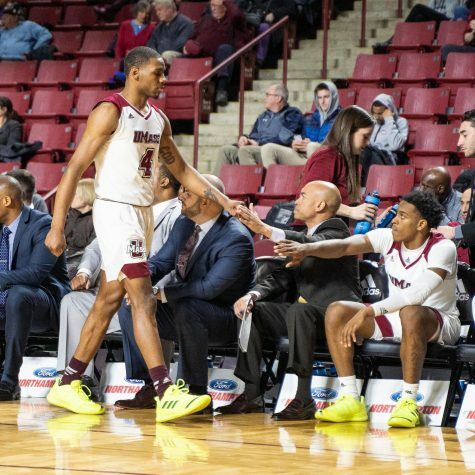 “It’s nice to see the guys share the basketball, have a great attitude and compete at a pretty good level and they come away with a victory,” UMass coach Derek Kellogg said. UMass jumped ahead of La Salle (8-10, 0-3 A-10) in the first half, holding a 10-point lead at the end of the first 20 minutes of play. For the Minutemen, assists played a large part in shaping the game, and it was a career-high night for Javorn Farrell and Gary Correia with assists, earning five and seven assists, respectively. Much of the Minutemen scoring came from inside the paint, with 54 of its 74 points coming from inside the painted square. Sean Carter controlled the paint with 15 points, as did Terrell Vinson with 11 points, both season-highs. Guard Anthony Gurley headed the Minutemen in points for yet another game with 20 points. Gurley’s play proved influential with three minutes, 42 seconds left in the game as his 3-point score snapped a 12-5 LSU run and gave UMass enough insurance to finish the game. Contrary to the games it played earlier in the break, the Minutemen shot well from the field (50.8 percent), although struggled from beyond the arc (18.8 percent). UMass also didn’t meet the bar it set in terms of free throw shooting either, as it shot just over 64 percent. 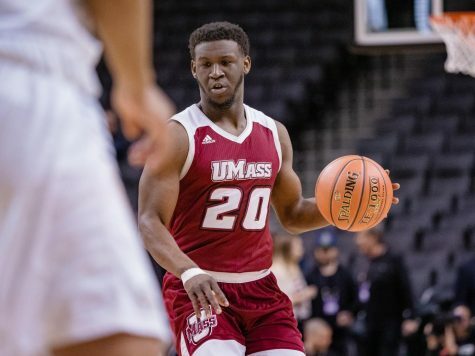 Despite holding a deadlock for the majority of the first half, UMass succumbed to a late 21-4 run in the first 20 minutes to eventually fall, 79-50, to the Musketeers. The game was knotted up until XU (11-5, 3-0 A-10) started a run that put the Minutemen scoreless for the final 4:30 of the half. Musketeer guard Tu Holloway scored 15 points for the Musketeers in the first half, including 11 points in a four-minute span. “I thought Tu Holloway dominated the game from the point guard position,” Kellogg said. Things didn’t slow down in the second half, as UMass allowed a 13-0 run within the first eight minutes to trail, 60-33. The deficit built up even higher to 33 points with just under four minutes left in the game. Gurley led the Maroon and White for the 14th time in the last 15 games with 12 points, an amount that the senior has earned in every game this season. Gurley had little help from the rest of the UMass lineup except for Carter (nine points, five rebounds) and Freddie Riley (seven points). The Minutemen could not have handpicked a better way to start off Atlantic 10 play than by defeating Dayton, last season’s National Invitational Tournament champions. On Jan. 9, the Minutemen (9-5, 1-0 A-10) battled the Flyers (14-5, 2-2 A-10) down to the very last tick of the clock, defeating their first A-10 opponent of this season, 55-50. 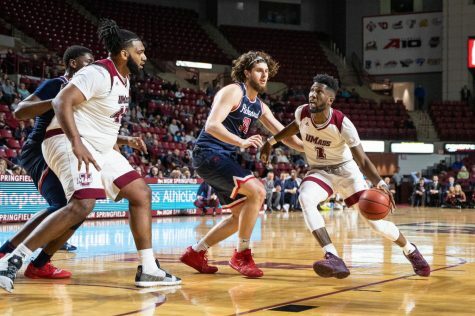 While UMass stayed ahead of the Flyers in the second half in rout to victory, it wasn’t without UD playing persistent basketball that kept the two sides knotted for the majority of the contest. Neither team could find the basket in the second half, with the Flyers shooting 9-for-31 and UMass shooting 4-for-17 in the game’s final 20 minutes. 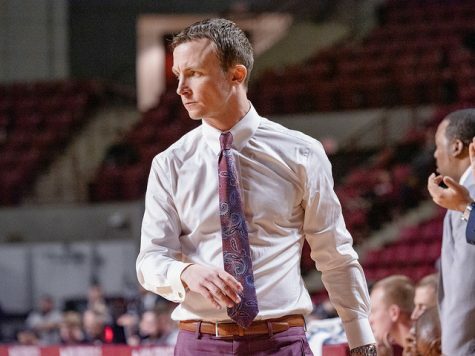 With poor shooting plaguing the Minutemen, UMass found a heavy amount of aid from the free throw line in the second half, going 20-for-27, as UD fell into foul trouble early on. Furthermore, UMass kept up the defensive tempo to not allow the Flyers to make runs as the Minutemen held UD off on many transition plays. “I thought we were as tough on the defensive floor as we have been all year,” Kellogg said. 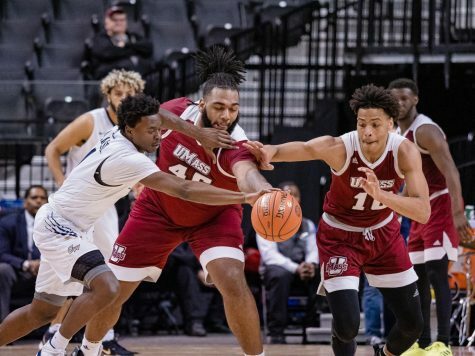 Along with going to the free throw line and holding off the Flyers’ offense, UMass played a different style of basketball than typically seen. The Minutemen passed the ball several times before making runs at the hoop and watered down the shot clock on each possession. 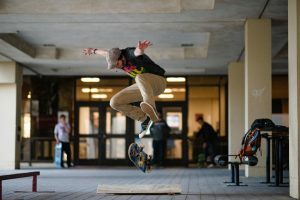 “I thought some of the guys were a little more effective in this style,” Kellogg said. 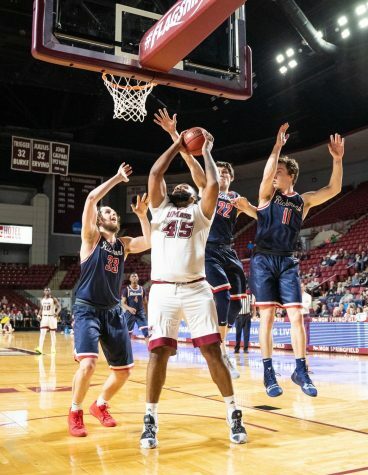 Gurley (15 points, four rebounds), who was silent in the first half with four points and two rebounds, lit up as he added 11 points to the UMass campaign in the second half. Correia made his return to the UMass lineup, playing 27 minutes and scoring five points with three assists. Losing by 29 points probably wasn’t the way Kellogg and the rest of the Minutemen lineup wanted to start the new year. The damage to UMass was done early on, as the Blue Devils came out of the gate with a 33-9 run that put the Minutemen too far behind. CCSU had a lot of help on the offensive side of the floor with three of its players scoring 20 or more points on the Minutemen. The Blue Devils were led by Robby Ptacek, who tied his career-high of 26 points. Shemik Thompson and Ken Horton both scored 24 points. Gurley once again led the Minutemen in scoring with 18 points, but found a lot of help on the scoring end from Putney, who nabbed a career-high 14 points. The Minutemen couldn’t find a way to score as well as the Blue Devils, shooting 24-for-58 (41 percent), including 3-for-17 from beyond the arc. CCSU looked to be the opposite, scoring 31-for-55 (56 percent), as well as shot over 80 percent from the charity stripe. The Minutemen closed out 2010 with a convincing 71-54 victory over the Terriers at the Mullins Center. The contest was not any normal encounter either, as Gurley earned his 1,000th point against BU off of a free throw. Gurley is now the 42nd player to score over 1,000 points for UMass. While Gurley led the Minutemen with 21 points, the Terriers had three players in triple digits, which had UMass reeling for awhile. With 10 minutes left in the game, the Minutemen opened up BU as the UMass scored 13-straight points to pull away from the Terriers. The run was finished with a voracious slam by Sean Carter, who finished the game with four points and a pair of blocks. Compared to its opponent, UMass played successfully from the field, going 22-for-61, while BU shot 18-for-57. Successful 3-point opportunities aided the Minutemen, as they scored just as many 3-pointers (five) in the second half as BU did over the entire 40 minutes. 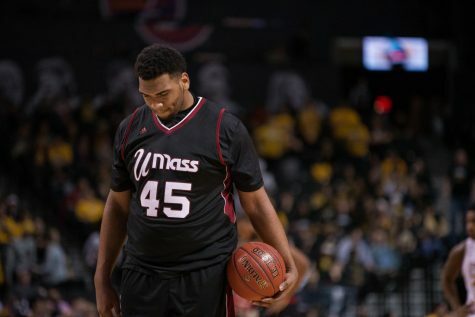 Additionally, UMass found help from the charity stripe, as they shot 15-for-16 in the second half. UMass had a 7-0 start to its season before the undefeated run was spoiled by Boston College. On Dec. 22, the Minutemen came close to ending No. 24 Central Florida’s undefeated streak, but fell, 64-59, in a game that went down to the wire. With under four minutes remaining, UMass found itself down five points to the Golden Knights (11-0) with a heavy amount of momentum heading into a timeout. 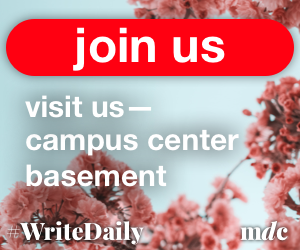 Despite Gurley draining a 3-pointer and guard Daryl Traynham taking an elbow to gain possession, the Minutemen could not pull enough strings together to defeat UCF with the Golden Knights, putting UMass to bed with key free throws from Marcus Jordan. 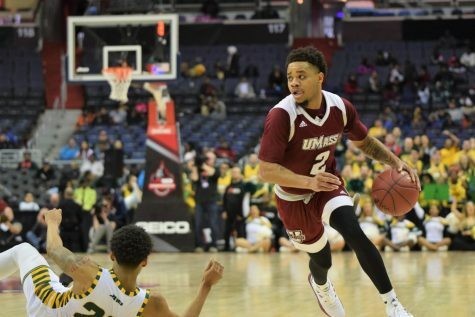 With Correia out because of a stomach virus, Traynham got the start for UMass at the point guard position. The freshman guard did not disappoint as he earned five points and the same amount in assists and rebounds. STUDENTS! Start going to the basketball games! We make the Mullins Center one of the toughest places to play in college hockey, let’s do it for college basketball. I know you all watch the games on ESPN and CBS, why don’t you come to ours? GO UMASS!